One type of fresh water fish that is very popular in Indonesia and is a highly profitable export products, eel highly favored by the Japanese because of the benefits it has, eel is a fish is a long serpentine and has properties very slippery and difficult to catch. 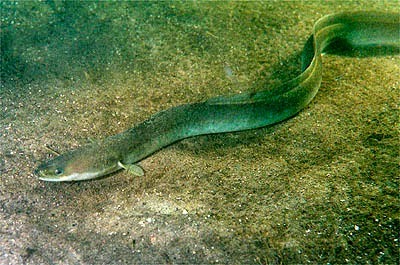 For some people, the eel is even considered as one of the animals are abhorrent and have been amused to see it. But behind it all eels proved to have enormous benefits for health. Nutrient content owned eels are also very abundant. What are the benefits and efficacy of eel? Overall, eel contain substances that are good for the health of which is protein, cholesterol, unsaturated fatty acids Omega 3 and Omega 6, high in calories, sodium, Vitamin A, C, E, Thiamin, Niacin, Ribovlavin, Vitamin B6, volat , Vitamin B12, Calcium, Iron, Magnesium Phosphorus, Zinc, and Selenium. Eels have a fairly high calorie content is 303 kcal per 100 grams of meat, eggs were higher than just 162 kcal / 100 grams skinless beef and 207 kcal per 100 grams. This makes the eel into a stamina enhancer foods pretty good. 2. As a rich source of proteins. This fish also proved to have a very high protein content. Protein content is 18.4 g / 100 g of meat equivalent of beef protein (18.8 g / 100g), but higher than egg protein (12.8 g / 100 g). As we know that protein is very good for helping build the damaged cells so that the eel can be useful as a source of protein is quite abundant and safe to consume all ages. This fish also contain arginine (nonessential amino acids) that is affecting human growth hormone. Commonly referred to as human growth hormone (HGH). HGH is what can improve muscle tone and reduce fat accumulation in the body. Several laboratory tests can also produce that arganin inhibit breast cancer cells. Iron content owned eels pretty much is 20 mg / 100 g, the number is more than the iron content in eggs and meat were only 2.8 mg / 100gram. Consuming 125 grams of the eel every day to meet the needs for the body's iron is 25 mg per day. Iron is useful to prevent anemia. Phosphorus content in the eel its value two times higher than the phosphorus in the egg. Without the presence of phosphorus, calcium can not form bone mass. For this reason a certain amount of phosphorus is needed for the body to make bones strong conditions. But to watch out for are eel is one type of fish that has a fairly high fat content. Fat content in the eel is almost equivalent to the pork fat (28 g / 100 g). So for consumption should not be excessive because it can be dangerous to health. Very good if eel cooked in roasted ways to reduce the fat content and not cooking by frying because it will increase the fat content. Consump eel in normal levels. Hopefully the above information can be helpful.